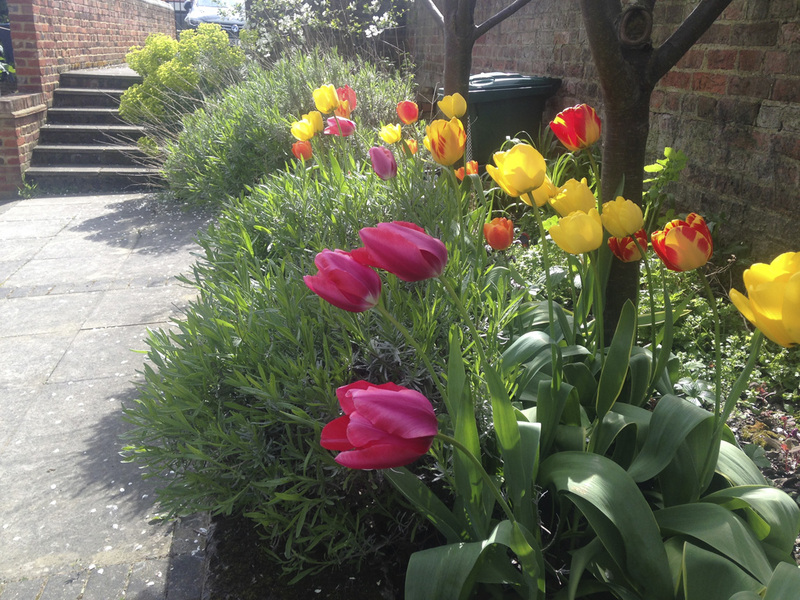 There's a corner of the veg patch garden where, in late 2013, I planted tulips that I'd bought during a visit to Sarah Raven's Perch Hill Farm. Her shop is unbelievably tempting so I was very restrained in coming away with just two bags of bulbs. One set didn't do at all well but these, her 'Apricot Beauty' set have come back and flowered every year since - now in their fourth year of flowering. That's very good value. 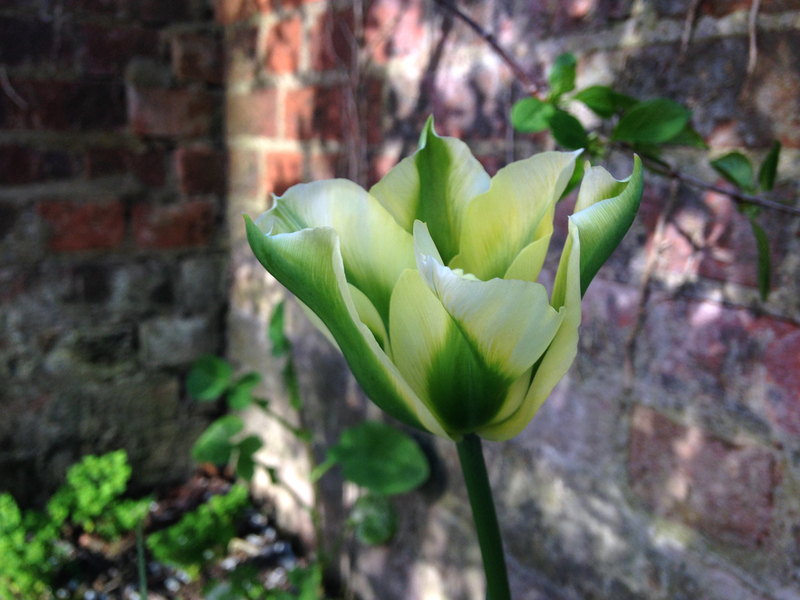 The Exotic Emperor's are aptly named - they open in the form that we'd expect from a tulip but, as the flowers age the petals widen fully to resemble Chinese water lilies. It's quite spectacular and they seem to last for a good month. 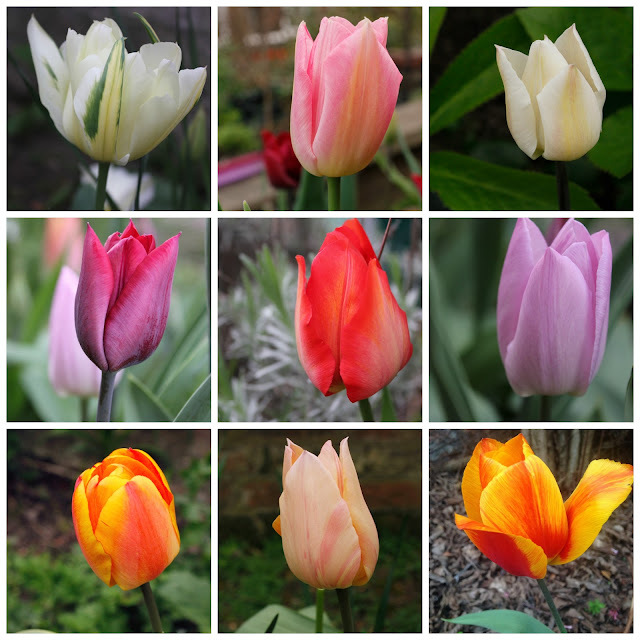 The other two varieties in the set let the Emperor have his day then Apricot Beauty opens to support the now open-petalled show before Spring Green thrusts up to counterpoint the final lily-like days of the Emperor. It's a great display, subtle but showstopping. The Emperor still rules but there are a few less of the other two. Reinforcements will be acquired this autumn. I'll put it in my garden diary now in case that thought slips away over the summer. 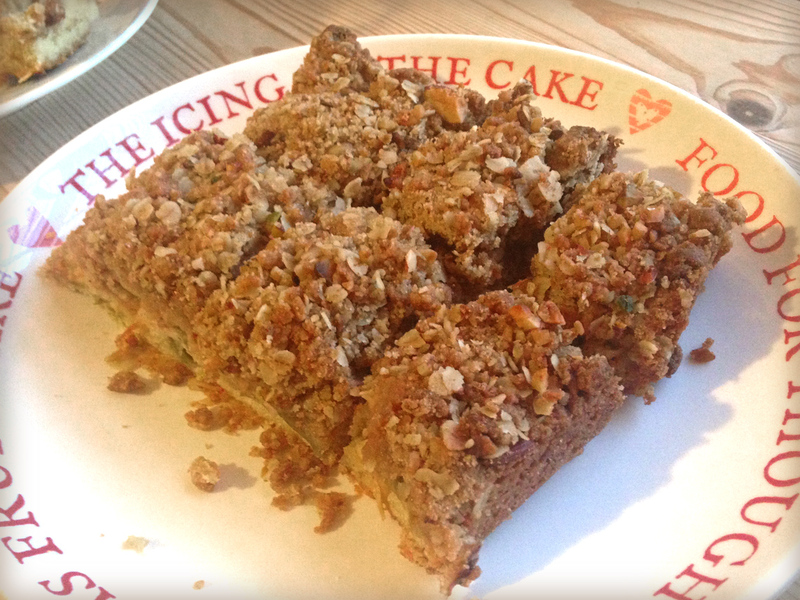 Thinking pink: Rhubarb, how do you eat yours? Not only am I surrounded by blossom but there's rhubarb and purple sprouting broccoli to pick too - what's not to love about spring! 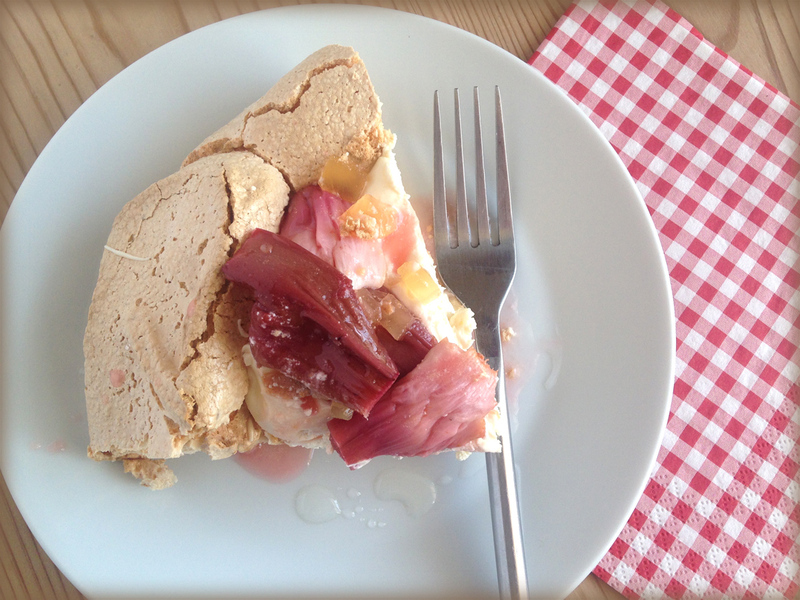 The rhubarb season is now well under way here in the south-east of the UK - and hopefully where you are too. I'm spoilt for choice this year as both my Champagne rhubarb plants have got off to a good start this year with nice long pink tasty stems. 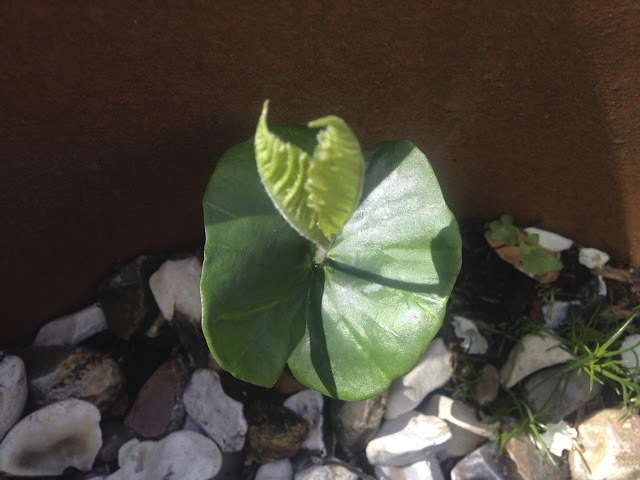 Since the above photo was taken, both plants have produced a flower stalk - swiftly removed by me - which shows they're not entirely happy growing under the fruit trees. I'll be moving both plants next winter into a sunnier spot with good rich soil. The Glaskin's Perpetual that I grew from seed a few years ago has been a little slower off the mark. I can live with that though because a friend lets me pick from her very vigorous rhubarb growing on one of the allotment gardens in the flats. Lovely long pink stems have been brought into my kitchen since mid-March. 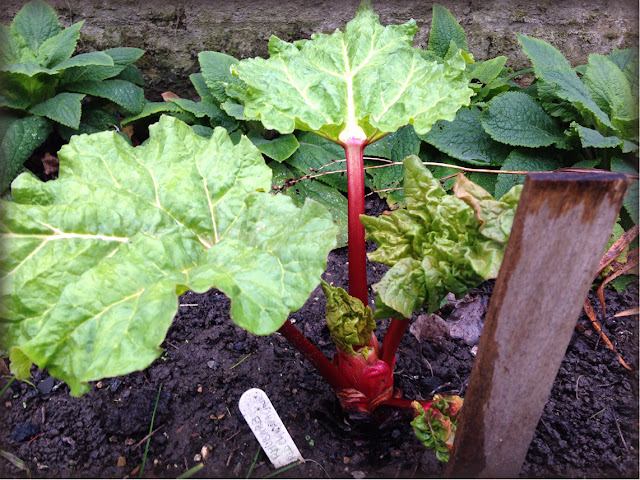 Amazingly, this friend doesn't even like rhubarb so never picks it; I think that's why it's so healthy, its strength has never been depleted by regular picking! Until now, of course. ;) She doesn't know what variety it is, could be Timperley Early going by the timing. 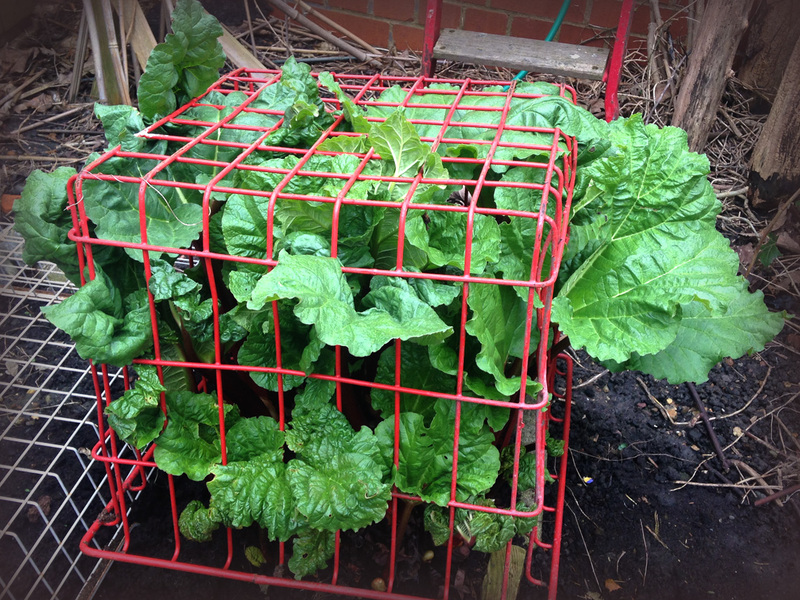 Using an old school crate to keep marauding animals away. At the shared allotment I counted eight rhubarb plants. Eight!! They're quite small so the team thought a little experiment might be in order. A few weeks ago, we chose the runt of the litter to see if we could force a few stems; a tall black bin was placed over the plant and weighed down with a brick. In just a few weeks the bin was removed to reveal a few pretty stems - tall, bright pink, tender and with beautiful yellow green leaves. The proper time to force rhubarb is when the crown is just beginning to show buds - I must remember that for next winter after I've mulched around the plants. 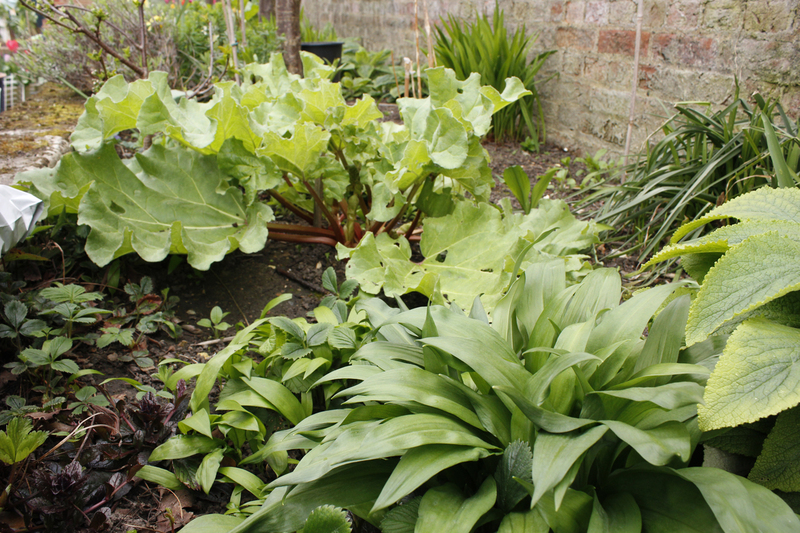 The RHS advices to stop forcing rhubarb in April and not take any more stems from the forced plant so that it has time to recover, or to not pick at all from that plant for a few years. With all these stems to choose from, I'm have a grand old time discovering new recipes. At first I made a compote for yogurt by chopping the stems into 3" lengths, roasting them in the oven, cooling, then chopping stem ginger into this. Simple and tasty. Then I got a little more adventurous as my niece was coming over for supper. I whipped up meringue for a pavlova, filled with cream and laid roasted rhubarb and chopped stem ginger over the top. Tasty and visually tempting. The stems kept coming so I turned to Nigel Slater's Tender II - a veritable tome of inspiration for fruit growers. 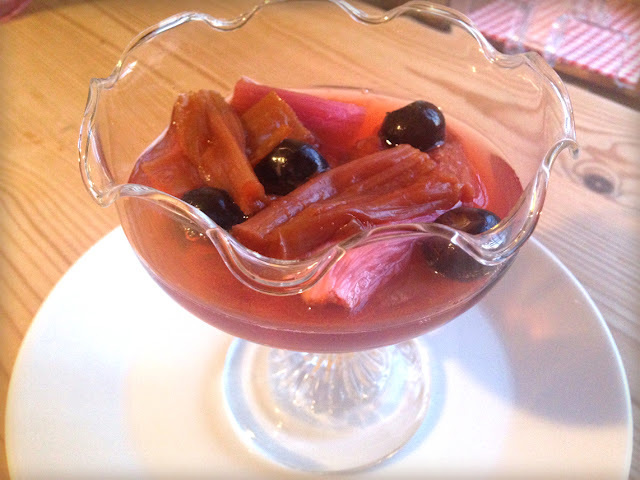 Sloe Rhubarb grabbed my attention; a simple affair of roasting rhubarb stems in the oven with a bit of sugar and a good slug of sloe gin. (Plus, later, a few blueberries.) Nigel writes that sloe gin can be hard to get hold of - a very good reason to forage for sloes in the autumn and the reason my foraging has produced a well stocked cupboard. I served the delicious results with some single cream which Mr Slater says is not strictly necessary. Although sometimes it just is. Perhaps not just for tea time? And speaking of custard, and with the sun beating down (at least for today), my next foray into rhubarb heaven will have to be rhubarb fool, with cream of course. For a week forecast to be cloudy but mild, it's turning out rather splendidly. I've seen bright warm sunshine every day. 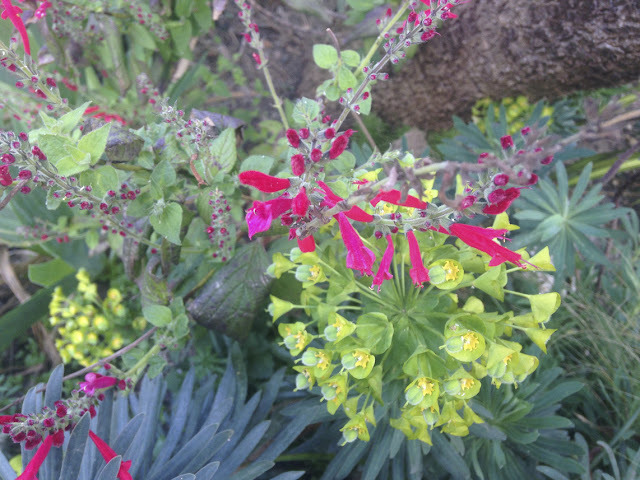 I was so enjoying the garden yesterday, looking at some of the amazing colour juxtapositions and making the most of a dry and bright day to get some more gardening done, that I ran out of time to post these Almost Wordless Wednesday photos. 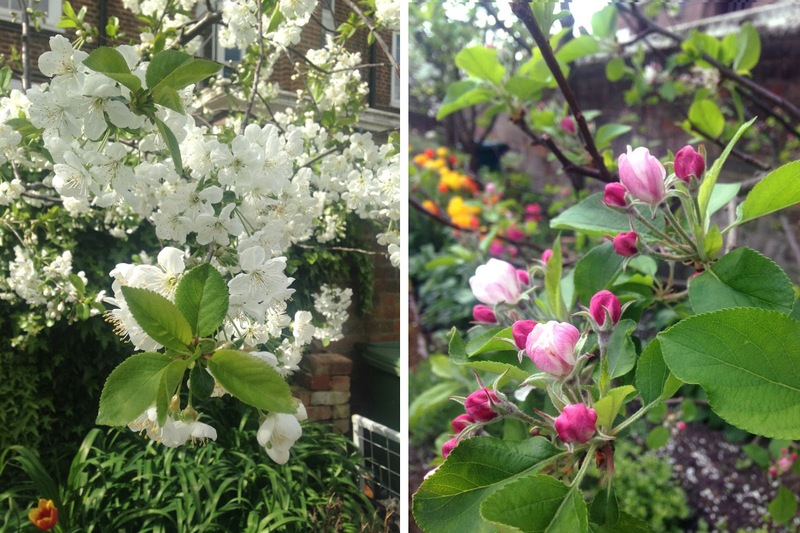 These are just iphone pics, snapped while wandering in the sunshine but I hope they give a flavour of what I enjoyed. I'm loving this spring weather - the perfect climate for me, not too hot! 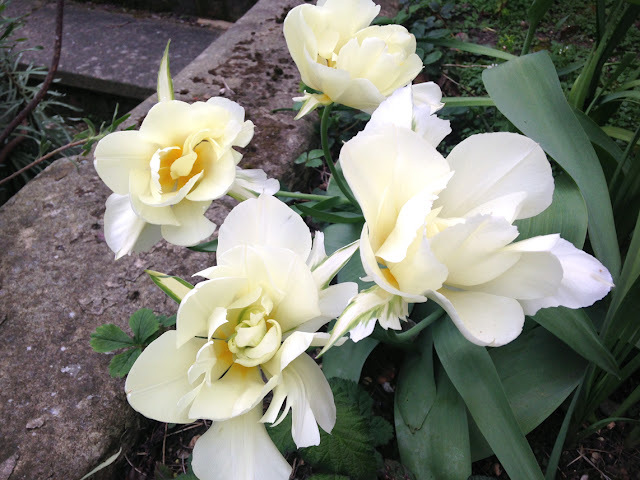 So worth going out in the cold to plant bulbs in November - although these are the cheap ones planted three years ago and now coming back for their fourth showing. Bargain! Drought border - so dubbed because the hose won't reach that far. 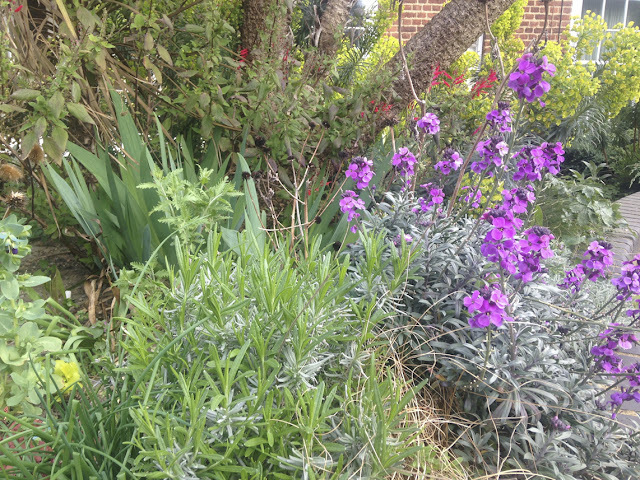 Lavender is coming back so strongly next to the Erysimum Bowles' Mauve that it's squeezing out a bronze Carex in between the two. Iris 'Edith Wolford' at the back gets a nice baking heat on its rhizomes, Cerinthe (left of pic) self seeded for which I'm always grateful, Euphorbia behind the Cordyline australis (trunk seen) will be interspersed with grasses when they reshoot and there's a curry plant and Stachys byzantina to echo the silvery leaves of the Erysimum just out of shot. 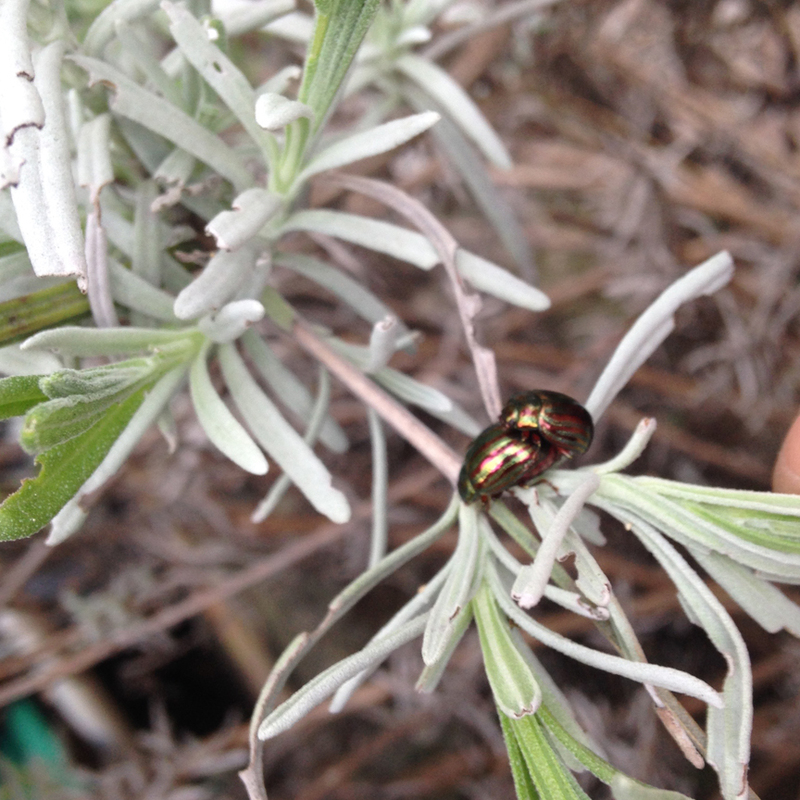 And I found my nemesis, the Rosemary Beetle, sunbathing on the Perovskia (behind the lavender)! 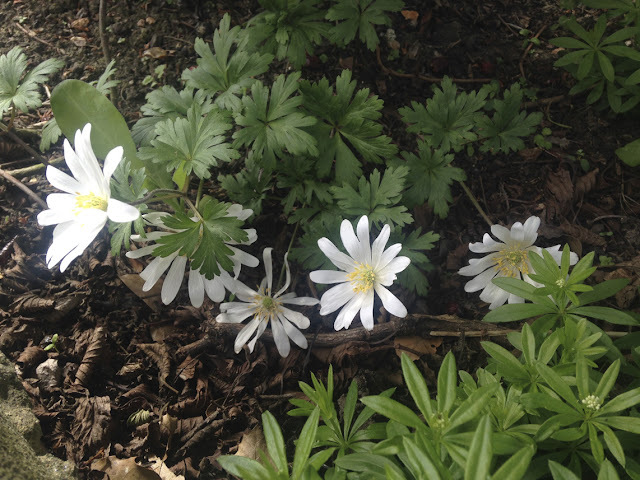 Nice calm Anemone blanda and Galium odoratum in the shady border. Schiaparelli pink Pineapple sage flowers against euphorbia in the 'washing line' drought border. Can anyone shed light on what this is? It's a cuckoo in the nest of my Sambucus nigra pot. Looks quite interesting though! 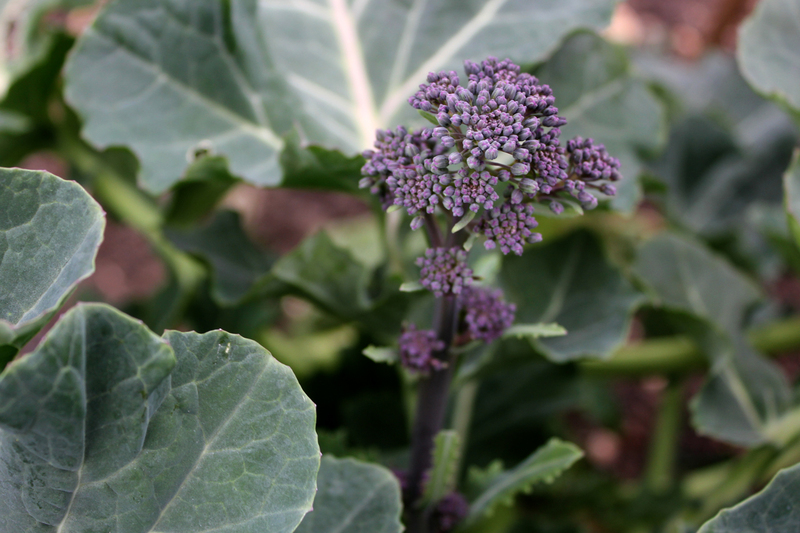 How's the week shaping up in your spring garden? The garden has really come alive in the past few weeks so this End of Month look-back makes for a really useful record for future years. March is the first month of spring in the gardening calendar but I don't remember seeing spring unfurl quite this quickly before. By mid-March, February's hellebores, snowdrops and crocuses had given way to primroses and daffodils. The little violets that I look forward to each year have been and gone but primulas, muscari, wood anemones and forget-me-nots have opened in their place. I breathed a sigh of relief that winter was over and spring beginning with all the anticipation for getting the garden started again. But that rapid turnover wasn't the end of it. By 20th March, I was posting photos of open tulips on my Instagram feed. The crocuses in the sieve planter had been replaced by bright red dwarf tulips, the borders were brightened by purple wallflowers, honesty, cerinthe, cowslips, primulas and lungwort (a name that does no justice to pretty Pulmonaria) - even the pear tree had buds about to blossom. The weather of course has been all over the place which explains the early arrival of so many flowers. Temperatures up and down like yoyos, clear blue skies tempting us outside into bitingly cold winds only to be followed by mild cloudy days. We've even had a couple of days when it felt hot like early summer. No wonder spring is rushing by! Hopefully April will be a steadying influence on the garden - I've already had to get the hosepipe out for the plants in the middle garden waiting to go into the soil. I'm also on a daily watch for rosemary beetle - there have been nibblings on my lavender (I can't grow rosemary here anymore thanks to these brutes) and I must have squished 30+ beetles in the past few weeks, with bonus points for the ones getting busy with the baby making. I was curious to see whether spring was this early last year and checked back on photos. 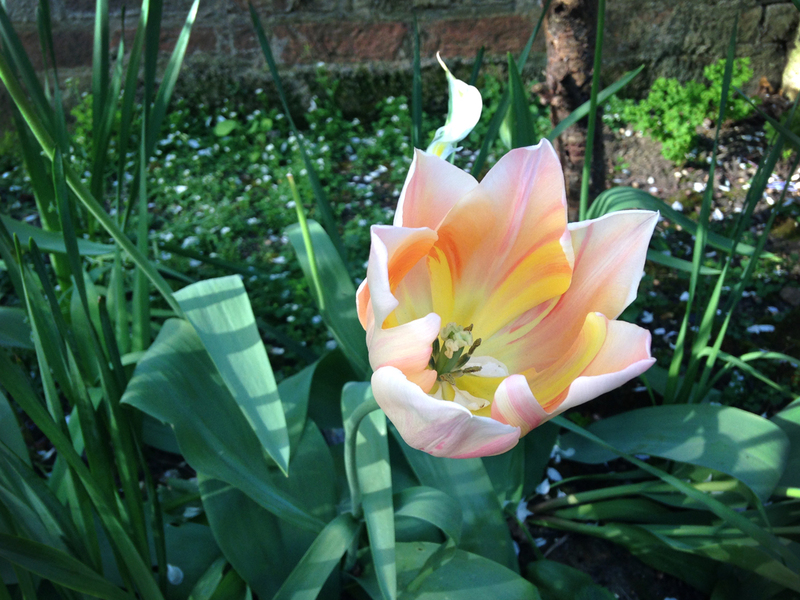 The first tulip opened on the 2nd April but it took until the 11th before the display had any impact. 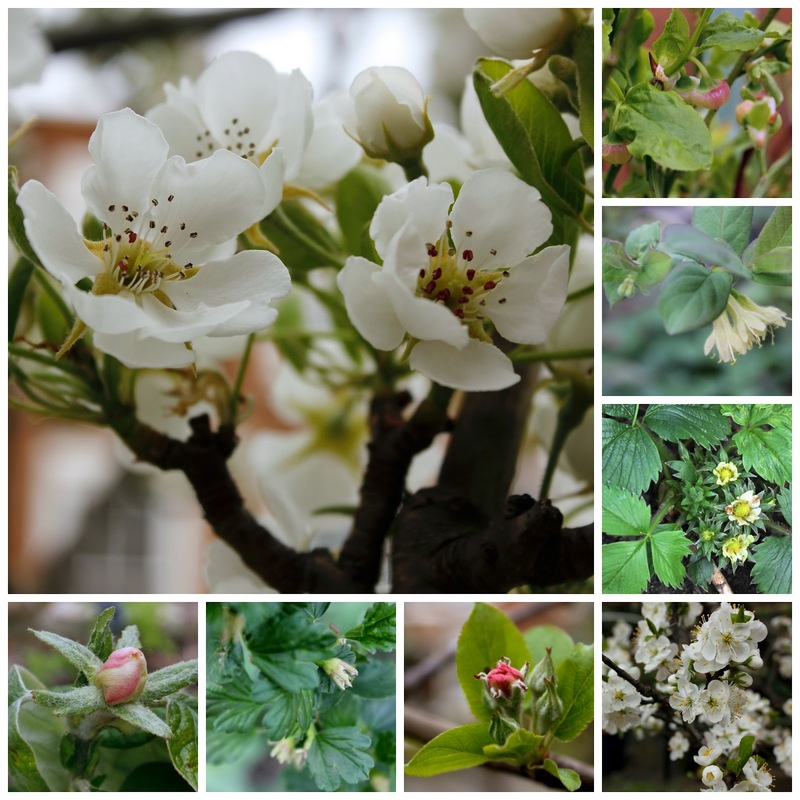 A similar story is repeated throughout the garden - asparagus shoots, ransom buds, cherry and apple blossom are all a good two weeks ahead of last year as is the rhubarb (first pickings were on 16th April last year). Spring has definitely come a good two to three weeks early here in the South of England. Mild winter? Climate change? All I know is that four years ago settling snow fell in the run up to a bloggers meet up at Great Dixter on the 28th March. I remember it clearly because the meet up was two days after my birthday and it was my first visit to Dixter. I was desperate to go and, serendipitously, the snow melted away on the day. This year, I'd have driven down to Sussex in warm sunshine. It will be very interesting to see what effect this has on the garden in weeks to come. Let's hope that it doesn't mean we'll get autumn in July! and looking forward to reading how everyone else's plots and gardens are faring.